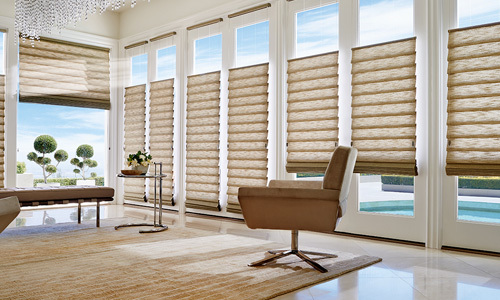 Vignette® Modern Roman Shades are the new standard in Roman shades. Vignette Shades roll up, stack and traverse side to side. 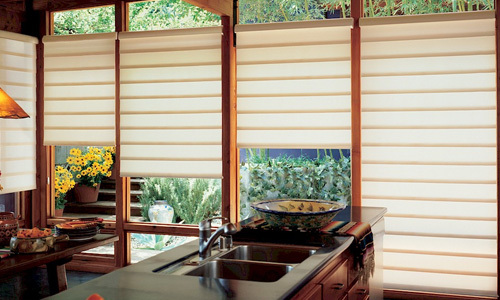 Innovative lifting systems, styles and design options make it possible to cover almost any window you can imagine. 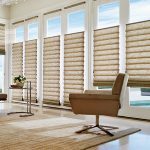 Clean appearance – Vignette Modern Roman Shades are beautifully designed both inside and out without exposed cords or grommets. 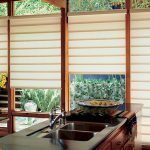 The back of the shades have a smooth, neutral backing so they look as beautifully finished from the outside as they do inside your home. Fold styles and sizes – Choose between Traditional™ soft, billowy, contoured folds in 3-inch, 4-inch and 6-inch fold sizes or Tailored™ crisp, 6-inch flat contemporary folds. A wide selection of woven fabrics to suit any decorating style from casual to formal, including EveScape™ room-darkening fabrics. Fabrics are made of durable 100% polyester, easy to clean and maintain. Color-coordinated hardware and cords provide a fully integrated look. Matching fabric-covered headrail and bottom rail create a unified look from top to bottom. Accents by the Yard™ – Vignette fabrics are available as Accents by the Yard™, great for completing any room with matching fabrics for decorative accents. Operating systems – The standard EasyRise™ continuous cord loop makes operation a breeze. The optional UltraGlide® retractable cord system features a constant cord length and LiteRise® cordless operation are both easy and child safe. The PowerView® system option is also available. UV protection – Provides 99% of UV protection when the shades are closed. 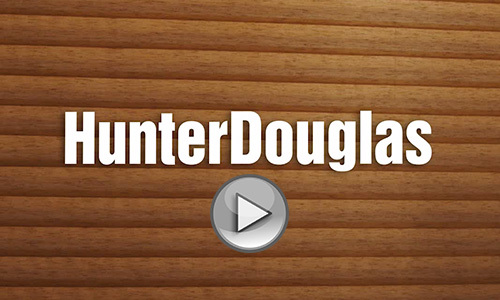 Lifetime Guarantee – As with all Hunter Douglas window fashions Vignette Modern Roman Shades are backed by the exclusive Hunter Douglas Lifetime Guarantee. 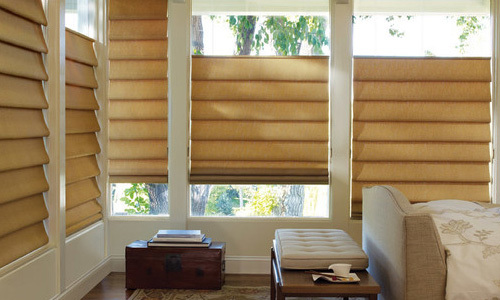 Alko Blind Cleaning features Hunter Douglas Window Fashions. Interested in one of our many service call today or click to receive a free quote! 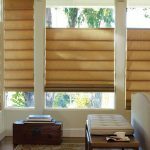 Serving Portland, Vancouver and surrounding areas, we are the one-stop source for all your window covering needs including custom window shades, draperies and blinds. Copyright Alko Blind Cleaning - All Rights Reserved.